One of my hobbies is to collect cartoons with biblical motifs. One favorite depicts two dinosaurs sitting on a mountaintop as they watch Noah and the ark sail away. 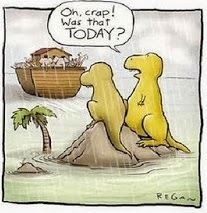 The one dinosaur says to the other, “Oh crap! Was that today?” I couldn’t help but think that maybe that’s why there are no dinosaurs today; they missed the boat (There's probably a more scientific reason for it, but that thought amused me. LOL). For me, that verse from Jeremiah 5:22 in the Amplified Bible became very meaningful with my first Cancun experience, and all these years later, I’ve never forgotten how God spoke to me early that morning from the balcony of my hotel room. As I thought about this, it occurred to me that there are some pretty absurd things that people have done in the name of religion, and even in the name of Christianity, because they seem to feel that God requires some act of service or sacrifice from them. Have you ever noticed that? In leading up to this favorite verse from my parents, the prophet Micah addressed some of those weird things that people have historically thought God would require of them. Yearling calves were thought to be some of the choicest sacrifices. The “thousands of rams” suggested that maybe God would be impressed with such a large amount of animals that He most certainly would grant the requests of people who offered them. The oil was always considered an important part of certain sacrifices, and so the extravagance of rivers of oil must be really something impressive to God. The early Cananites used to sacrifice their firstborn’s to their deity. As a firstborn myself, I’m sure thankful that is no longer the accepted custom today! It’s strange how today some people still seem to think the same way. Either by actual verbalization, or simply by implication, they like to highlight for others the excessive things they’re doing for God, as if to say that they are more special than others, or that God must be really impressed with them because of all the religious stuff they’re doing. But can we really do anything to impress God? Is God going to be more impressed by going to church versus not going to church? Is God more impressed by the $1000 check in the offering plate than the Toonie (slang for our Canadian $2 coin)? No. Anyone who would tell us that is ultimately just as confused as the people Micah was talking to. Justice. Mercy. Humility. These are not simply suggestions; they are requirements. Yes, that's Old Testament, and some might be tempted to argue that since we live now under New Testament grace, Old Testament principles no longer apply. In many cases that is perhaps true. However, justice and mercy and humility are also well documented New Testament principles too. Though we sometimes seem to have circumvented them, clearly God hasn't changed His mind about those requirements. What are the Law and the Prophets? I like to paraphrase them as anything and everything that could ever be said about God and who He is and what He expects of us – that is essentially the Law and the Prophets. Everything hangs on that. The love towards God and our fellow man is like the picture hook on the wall, while all other doctrines, church stuff, and any religious activity is the picture we like to show off to the world and impose on each other. But take away the “love” picture hook, and what happens to the picture? It comes crashing down to the ground and breaks up into many pieces. All Christian and religious activity, no matter how righteous it sounds, if it is done without “love” is just noise, says the Apostle Paul (1 Corinthians 13:1). If we love God and likewise love one another, then we please God. If in it we concern ourselves with the justice due our fellow man, we have met God’s requirement. If in it we are merciful, even to those who maybe don’t deserve it, we have met God’s requirement. If in it we learn to walk in true humility, as opposed to showing the world how great we think we are, we have met God’s requirement. That’s it; there is no plan ‘B’. What do you supposed they told him? Go sacrifice a bunch of animals like they did in Old Testament times? Regularly attend church and throw a bunch of money into an offering plate? Say a bunch of “Hail Mary’s?” Become a missionary or a pastor? Get a good study Bible and memorize a bunch of verses? Look for your special niche “gifting” and create a ministry around it? I’m not suggesting that you should or shouldn’t do some of those things, but the only thing that Paul and Silas told the warden was, “Believe in the Lord Jesus, and you will be saved.” It’s that simple. Again, there isn’t a plan ‘B,’ there are no other requirements, there is no other way to be saved. I so appreciate the faith example that I’ve been given by my parents, and in retrospect, I am not surprised the least bit that Micah 6:8 is counted by them as one of their favorite Bible verses. I have never known them not to be concerned with justice to their fellow man. I have never known them not to be merciful, even at times when I personally might not have been. I have never known them not to embrace a humble spirit. Lately it has become one of my favorite verses too. Maybe Micah 6:8 is more than only a favorite Bible verse; maybe it’s a sort of mantra, if you will, that accurately describes who we are (or ought to be) in Jesus. What does it mean to “be good” and what does the Lord require of you and me? The same thing He’s required of all of mankind since the beginning of time: “To act justly and to love mercy and to walk humbly with your God.” Perhaps anything less is to be like the dinosaurs in my cartoon and miss the boat of God’s perfect plan for us. I found this web site because of the dinosaur cartoon. After reading the name of it I was ready to copy the cartoon and get off the site. For some reason I started reading, the more I read the more I liked what I was reading. Congratulations, you have your head on straight. Bless you and thank you for the comment. I appreciate it.